Pettneu is a small village with a mere 1,500 residents; it is situated in the Stanzer Tal Valley between Landeck and the Arlberg Moutain. This alone is enough to make Pettneu a top-notch tourist destination: It is the skiing that draws the crowds to the Arlberg. On contrast to the party-towns of Lech, Zürs and St. Anton, Pettneu pampers a tamer image. It targets families and elderly people who are not keen on après ski activities (ie., getting drunk and laid). Pettneu is divided into a range of hamlets, of which Schnann is by far the most significant. The village was built in a position important for strategic reasons - it was nearby some very significant mountain passes. Most of the transportation of goods and people had to go through Pettneu, which helped a great deal to develop something like an economy in the village during the Middle Ages. Apart from a major road, it was paths for mules that ran through Pettneu, ensuring the settlement of a constant stream of tired traders keen on a shelter and a pint by the fireplace. The trade routes around Pettneu connected the village with the Lechtal valley and with the (now) Swiss province Engadin. The oldest written record of Pettneu dates back to 1330 and refers to the village as "Pudnew" - which is probably derived from the Latin "ponte novu", meaning "new bridge". In fact, until very recently there was a bridge in Pettneu that the locals called "Neue Brücke" (new bridge) - however, that one dated back to the 18th century and went down the Alp′s drain during a rather nasty flood in 2005. Until then, the bridge was among the few "sights" of Pettneu, being a rare example of a covered, wooden bridge built with no nails. Back to the main part of the story: Pettneu wasn′t a very happening place, but did have some traffic and thus a good reason to survive throughout the Middle Ages and more modern days. However, life must have been hard until at least around 1900. At this time, the first skiers discovered the Arlberg and recognised its potential as a premium skiing resort. Even today, Austrians claim (unjustified so!) that Alpine skiing was invented on the Arlberg by Hannes Schneider. Although this is not the case, nobody would doubt that skiing rapidly turned into a big deal - by the 1920ies, the entire Arlberg area had become a fancy winter holiday destination. Today, it is hard to imagine that Pettneu has existed before the advent of skiing. The immediate surroundings of Pettneu offer only some 15 kilometres of slopes, but there are some of Austria′s best "Pisten" within easy reach. Ski-shuttle busses connect Pettneu with top-resorts like St. Anton, the ride takes less than ten minutes. 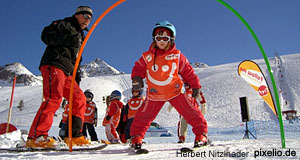 Nearby attractions include the other towns and villages of the Arlberg: Klösterle, Lech, Zürs, St. Christoph and Stuben. For day-trips and sightseeing, I recommend Landeck and Imst. Tyrol′s capital Innsbruck is not too far, either. By the way, if you are into shopping (which, being a heterosexual male, I am most definitely not), a trip to Samnaun across the border to Switzerland might appeal to you: For centuries, Samnaun was not connected with the "main land" by roads and thus granted a tax-free status to have access to goods from Austria. This persists today, and so you can find plenty of duty-free shops in the small village. Good for clothing, perfumes, liquors, tobacco goods and other stuff of that kind.